Black cotton bandana, 22" x 22". 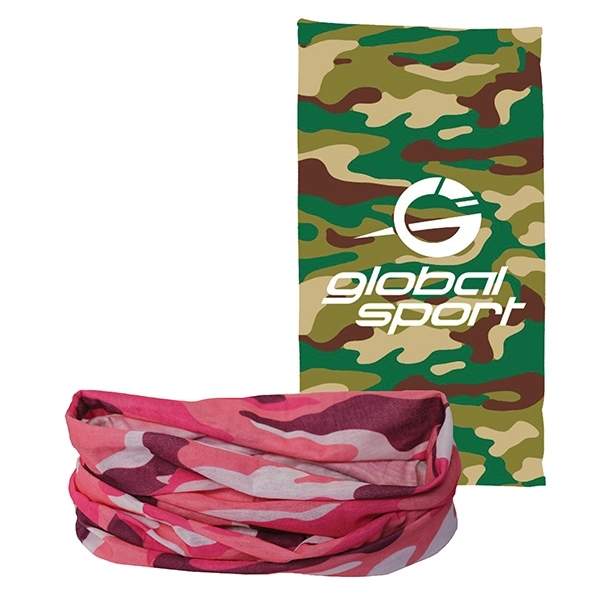 Priced per bandana but please order increments of 1 dozen. The Bammie - Multi-use headwear keeps you stylish at every game and event to support your team from head to toe. 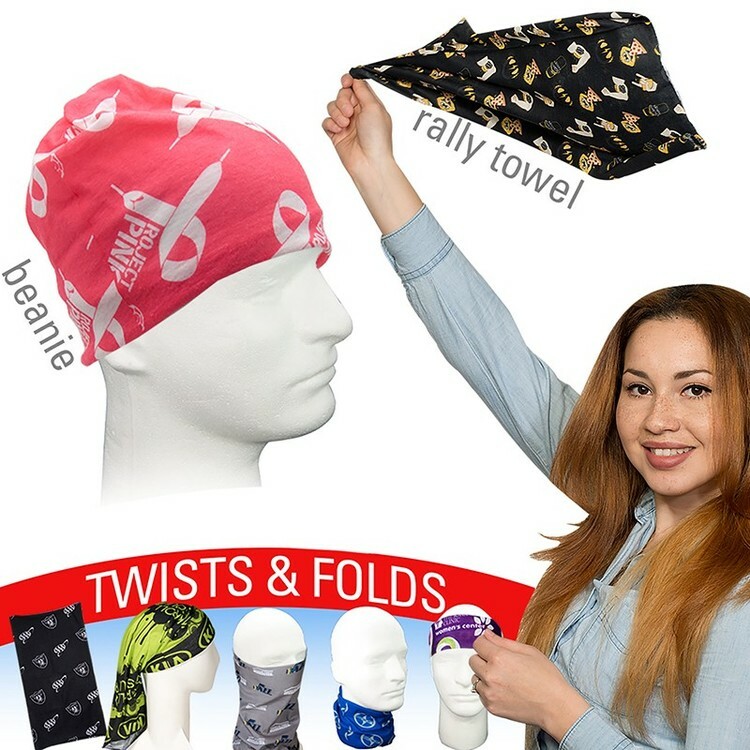 Use the Bammie as: Bandana, Scarf, Rally Towel, Headband, Face Mask, Hairband, Hair Scrunchie or simply create your own style. Due to its tube stretchy material you can wear it any way possible and it will fit everyone’s head. 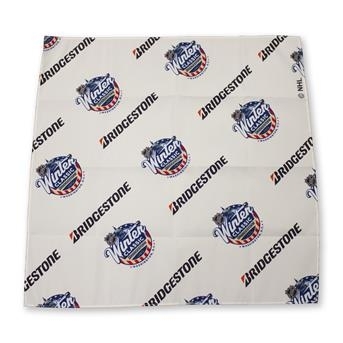 Use it during any season - it keeps you warm during the winter or at hockey games and cool in the summer on any outdoor event. It’s super breathable and comfortable! 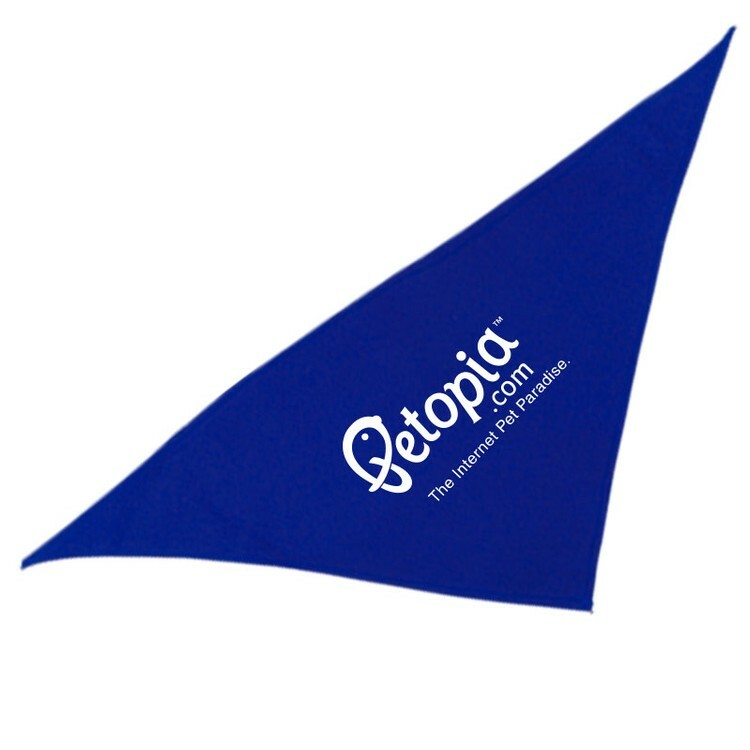 Brand it with your company or team colors and logo and you will get the attention you deserve! But the message doesn’t stop here, it is a hit for every selfie picture and will make its round on all social media! 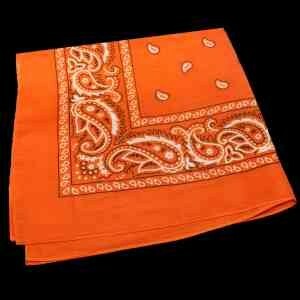 Orange Cotton Bandana 22" x 22"
Orange cotton bandana, 22" x 22". Priced per bandana but please order increments of 1 dozen. 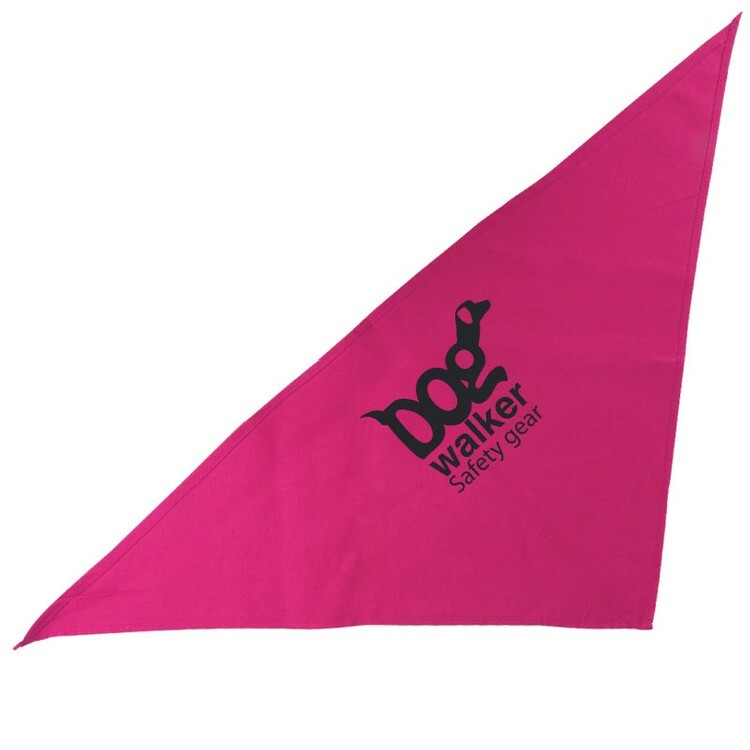 100% Cotton Triangle Bandanna for Larger Dogs. 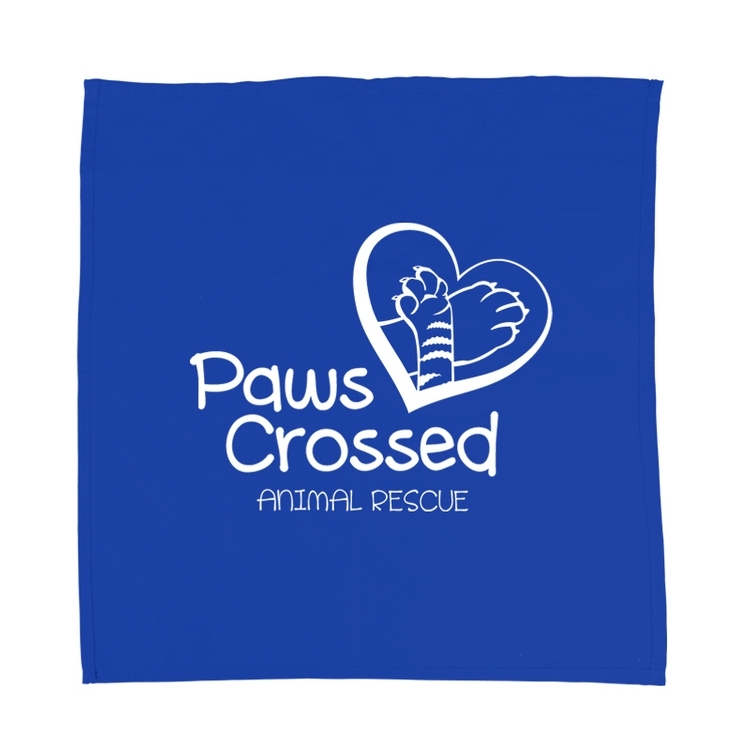 Bright colors, large imprint area - perfect for promotion of pet products and services. 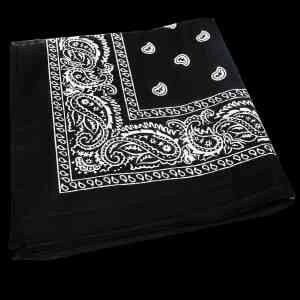 Large, 22" x 22" Hemmed Bandana - 100% cotton. Big imprint area, available in four colors. 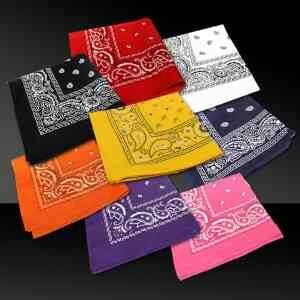 Blank Item Priced per bandana, please order in increments of 12 bandannas. Pink Cotton Bandana 22" x 22"
Pink cotton bandana, 22" x 22". 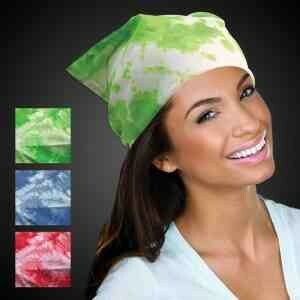 Priced per bandana but please order increments of 1 dozen. 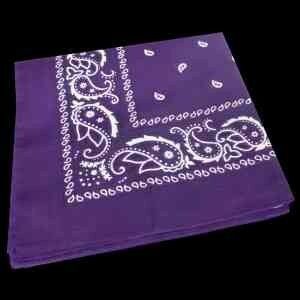 Purple Cotton Bandana 22" x 22"
Purple cotton bandana, 22" x 22". 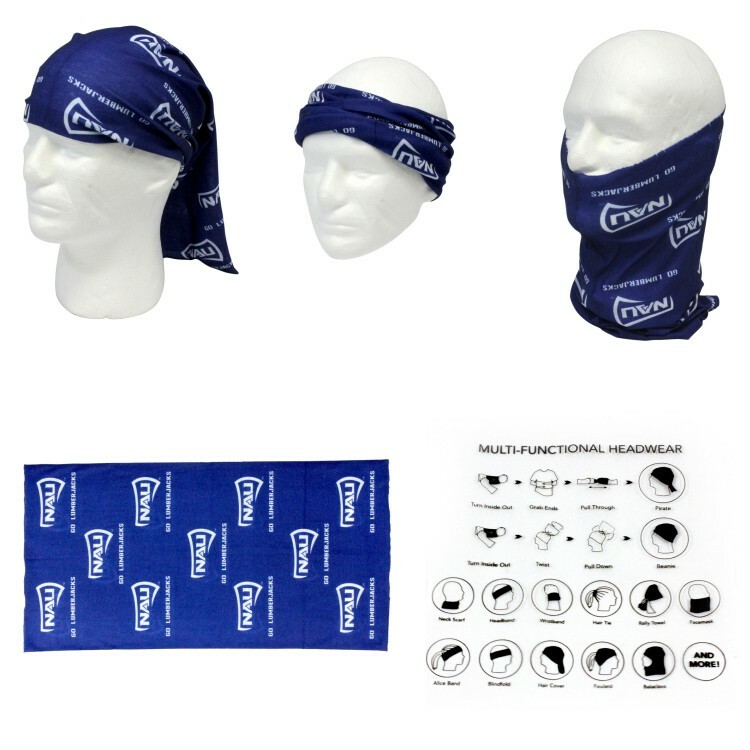 Priced per bandana but please order increments of 1 dozen. 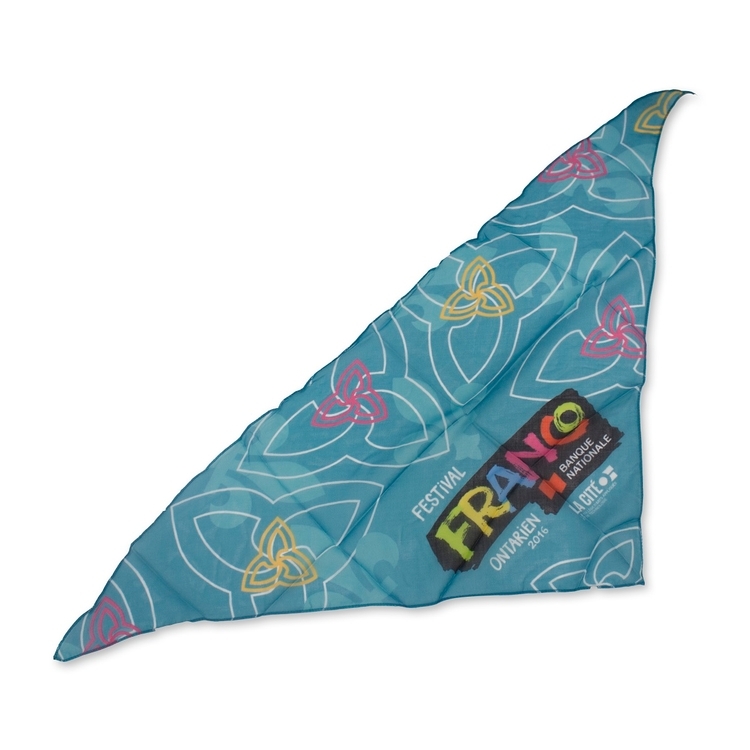 100% Cotton Triangle Bandanna. Great selection of colors, large imprint area. 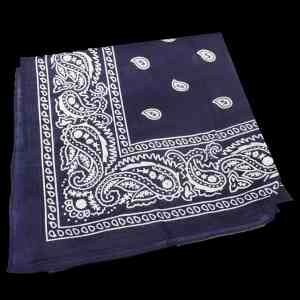 Blue Cotton Bandana 22" x 22"
Blue cotton bandana, 22" x 22". 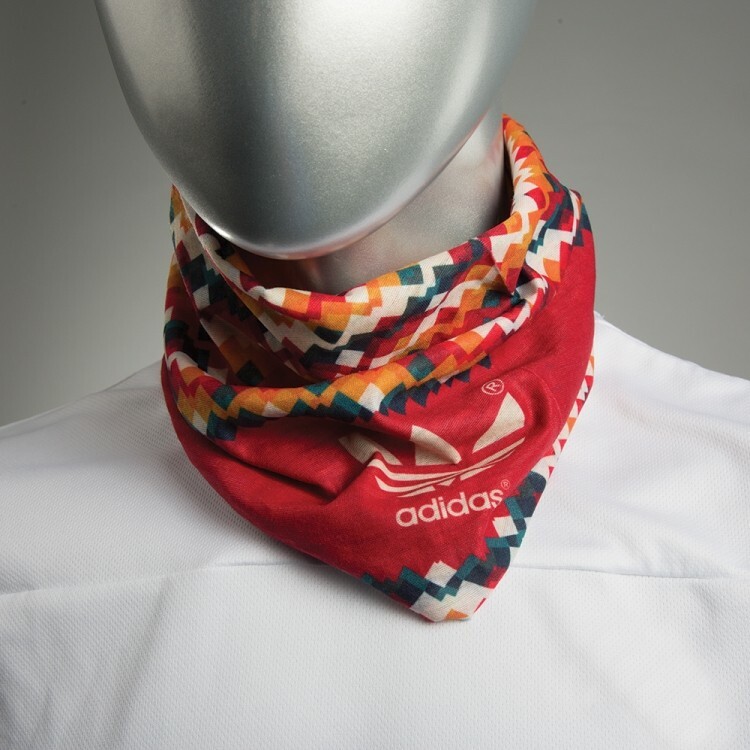 Priced per bandana but please order increments of 1 dozen. 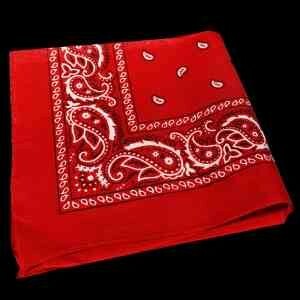 Red Cotton Bandana 22" x 22"
Red cotton bandana, 22" x 22". 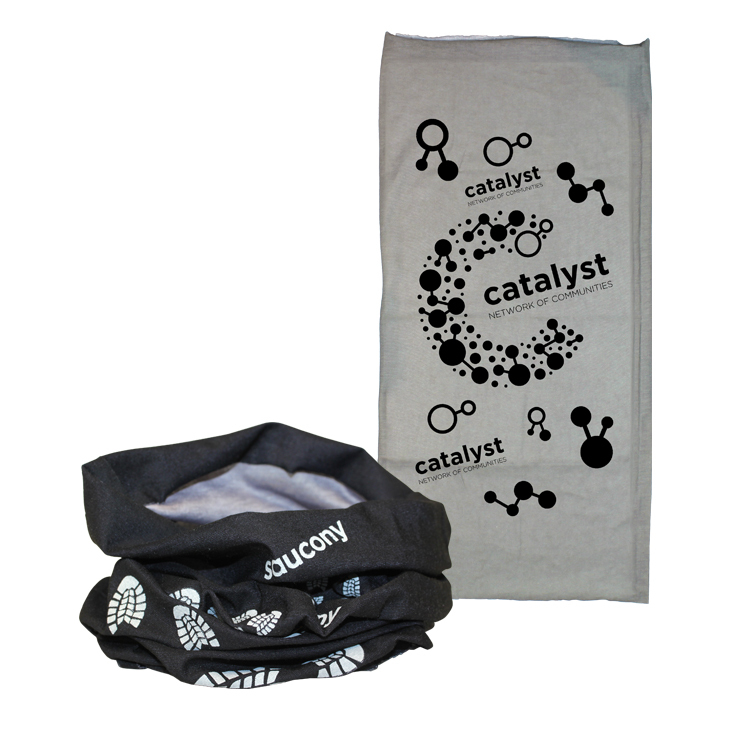 Priced per bandana but please order increments of 1 dozen. Our red, white and blue cotton bandanas feature stars and stripes for a patriotic look at your next 4th of July event. Use our American Flag Cotton Bandanas as napkins at your next Americana inspired event. 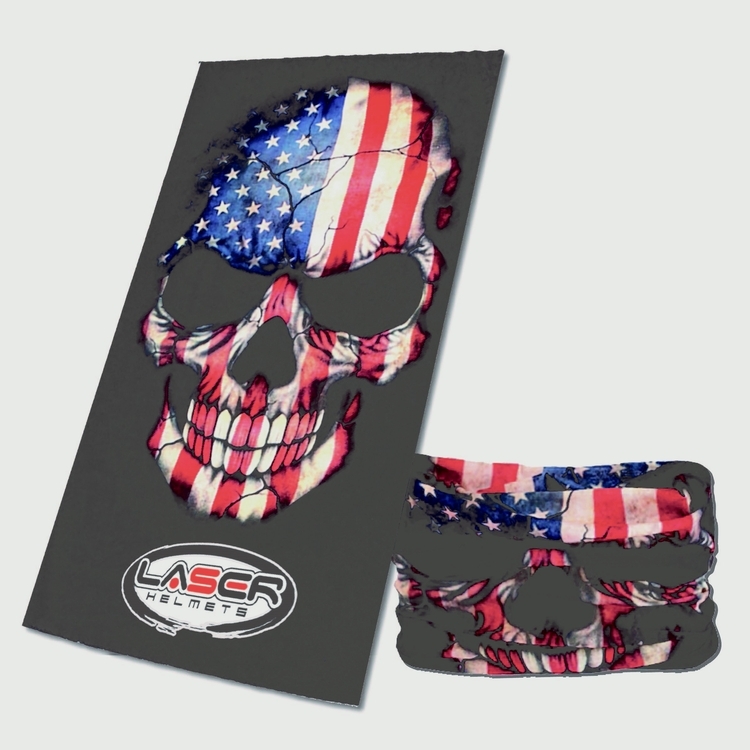 Each pack of 22" American Flag Bandanas comes 12 per pack. Perfect for all of your patriotic events from the 4th of July to Election Day. 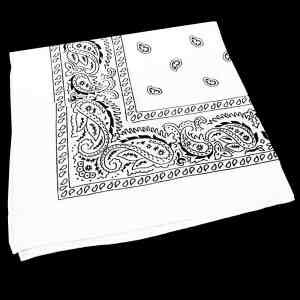 White Cotton Bandana 22" x 22"
White cotton bandana, 22" x 22". Priced per bandana but please order increments of 1 dozen. Made out of 100% Cotton. Stylize your pet with a colorful bandana. Made for medium to large dogs! White is 100% polyester.  Imprint Area: 15 1/2" x 15 1/2" x 22" - One sided imprints only. Cotton bandana, 22" x 22". Priced per bandana but please order increments of 1 dozen. 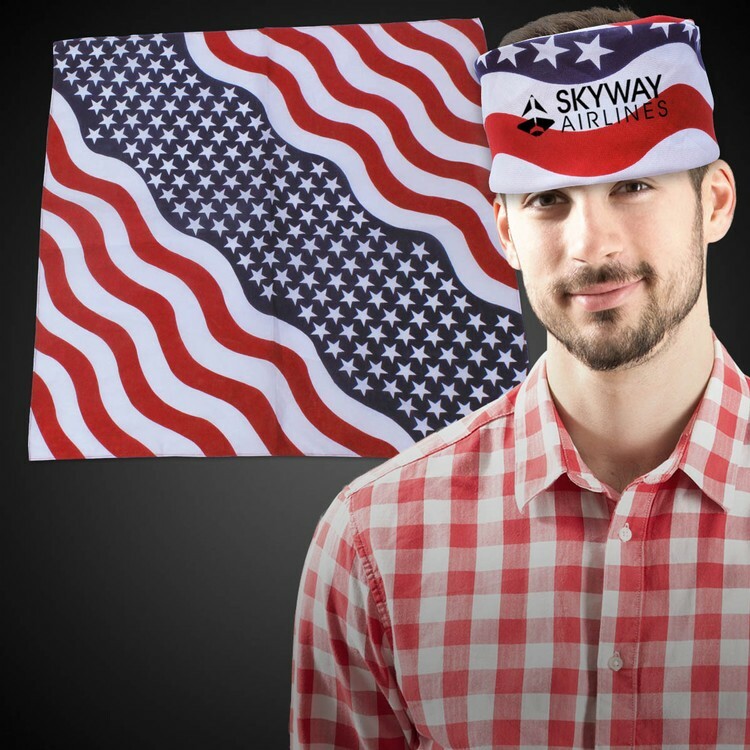 Show your American spirit with our bold American Flag bandanas! American Flag bandanas can be worn head-to-toe or used as an accent for your Fourth of July festivities, patriotic events, parades, or any other occasion you might have to celebrate the red, white, and blue. Pass American Flag bandanas out as party favors. Lay them out on tables to add patriotism to your party's d?cor. Dress up your pet! Add a frame to our bandanas for some patriotic wall art. Crafty Americans can sew American Flag bandanas into table cloths, table runners, and placemats for a lively table setting. You could even stitch your Flag bandanas into a blanket perfect for an Independence Day picnic or fireworks display. 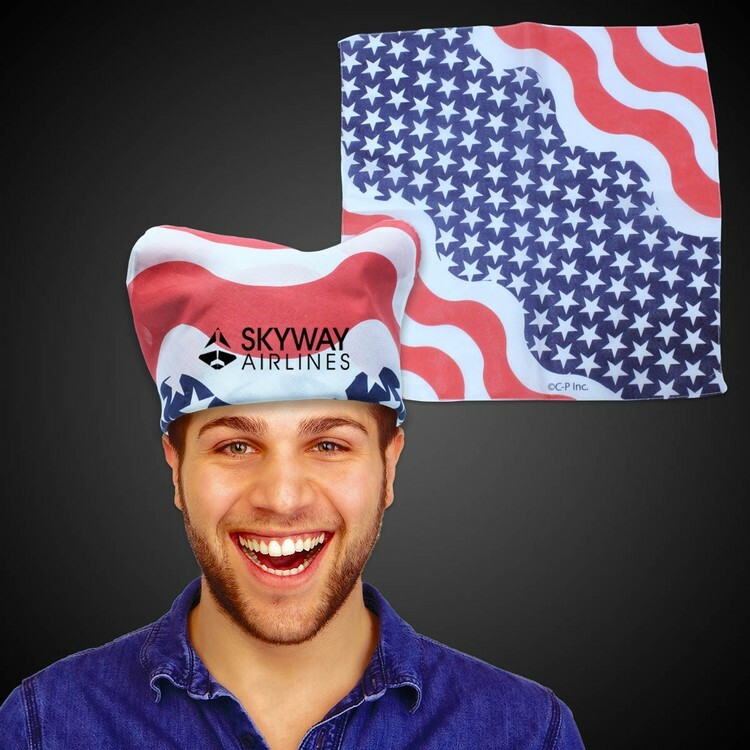 Celebrate and show your true colors with our American Flag bandanas.